The injury occurred in an April 6 game against the Calgary Flames. McDavid was driving toward the net when he got tangled with Flames defenseman Mark Giordano and crashed into the goalpost legs-first. Though the team initially feared a broken leg, X-rays revealed there was no break. McDavid then went for an MRI and second opinion. McDavid will not compete for Team Canada in next month’s World Championships. 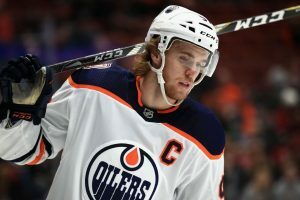 The 22-year-old, a candidate for league MVP, is coming off his third-straight 100-plus point season, matching his career-high with 41 goals and setting a new high with 116 points. The Oilers, however, missed the playoffs for the 12th time in 13 seasons.